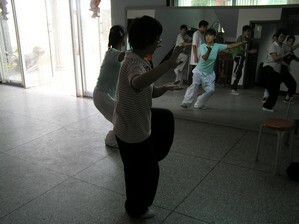 Chen Zhao Sen's Tai Chi School - The China Taichi Guide is a Directory of Tai Chi Schools & Tai Chi Teachers in China. 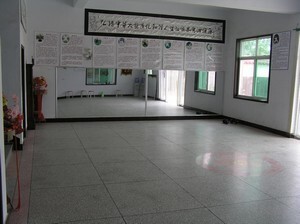 The Chenjiagou Gongfu Taijiquan School is a small, traditional Chen Style Tai Chi school in the village of Chenjiagou, headed by Chen Zhao Sen and his son Chen Zhi Wei. The quality of teaching there is excellent. The school welcomes students at all levels. It doesn't matter whether you are a complete beginner or a total expert on Xinjia Er Lu. Everyone is dealt with individually on the level you are at. Everything is taught at the highest level. The school itself has a warm friendly feeling to it. Age groups are mixed, and everyone eats together in Chen Zhao Sen's house on a daily basis. As one person commented, the cook is ever trying to fill your bowl with tasty home made noodles. Most students sleep in the school premises and things are set up pretty well to support your intensive study at the school. Nb. The school building was undergoing an expansion while I was there in 2013 which reduced the outdoor training areas. Things should be completed before Spring 2014 and hopefully a new outdoor area will be created in the field opposite the school. Otherwise training is done in the school courtyard and indoor practice rooms. The prices are about 5000Y per month for international students inclusive of as much food as you can eat and accommodation. Nb. This price is a guide only for beginner students learning Lao Jia. Please enquire with school about prices for learning other things such as Chen Sword or advanced studies such as martial tuishou as it can be significantly more. 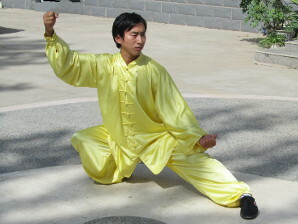 Chen Zhao Sen is the current head of a Chen family lineage, a direct descendent of Chen Wang Ting and in a line that has maintained the Tai Chi at the highest level. Most people in the West who have learnt Chen, will have some awareness of Chen Fake's line, which is now headed by Chen Xiao Wang within the family. There are other lines within the Chen family though and this is one of them. Chen Zhao Sen's Tai Chi is very clean. Every movement spirals around the dantian and his emphasis on this and the breathing is present all the time. He is able to move completely relaxed and soft, and yet the power is enormous if you ever feel it. He is famous within China, especially for his Chen Halberd and is often called 'King of the Halberd'. At the same time, he is a warm personality and seems to care very much for his students. He has taught Tai Chi for most of his life (he's now in his late 50's), and its clear that he is very happy with this role and takes it very seriously. But he is good fun as well and can take a joke. His family Lao Jia, is not exactly the same as that taught by Chen Xiao Wang or Wang Xi An, mostly I believe because their own Tai Chi has evolved in their generation, but personally I found no difficulty moving from Wang Xi An's version to Chen Zhao Sen's. Chen Zhi Wei is Chen Zhao Sen's son and has been trained in the family Tai Chi since he was very young. He is in his late twenties now and has been diligently training the school's in house students for many years. Over the past two years he has taken over much of the responsibility for teaching foreign students as well although Chen Zhao Sen does tend to supervise things still. Chen Zhi Wei is enthusiastic as a teacher and extremely competent in his family's Chen Tai Chi. 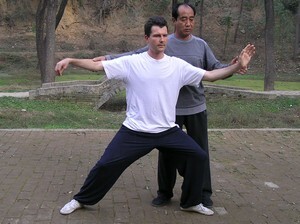 Chen Zhi Wei is assisted by a senior disciple of Chen Zhao Sen's called Huang Dong. 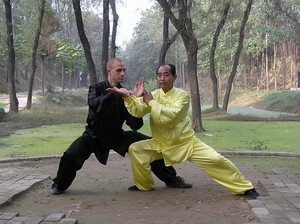 Huang Dong is also a highly accomplished practitioner and seems an ideal choice as a teacher at the school. He seems well versed in skilfully teaching beginners. I watched him leading Chan Si Jing and basic movements. He also speaks English reasonably well and is enthusiastic to improve it further so he is a real asset at the school. Chen Zhi Wei and Huang Dong are usually assisted by other disciples at times who have gone through the school's inhouse apprenticeship. Students will have different experiences at the school depending on their level and goals. Chinese and Western beginners often turn up here and take their first step into Tai Chi, in the school of a Chen Grand Master. The way its works is very simple. One of the senior instructors will usually introduce new moves each day and then assistant teachers will support and guide the beginner's practice throughout the day. 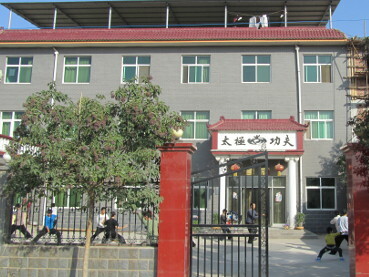 The school trains many Chinese students from a young age and when they graduate, usually after many years of study, the best ones are invited back as assistants. Their own Tai Chi is also excellent and so this creates an ideal environment for beginners to learn one to one, with Chen Zhao Sen, Chen Zhi Wei or Huang Dong supervising. I watched a complete beginner learn Chen from day one. A tiny Chinese girl, she wasn't at all familiar with Tai Chi movement but was patiently taught by two young assistants throughout each day. It was beautiful to watch. The beginning looked pretty hard, as she started working on Chan Si Jing and the Chen movement of the waist, knees and arms, but I was almost envious of her receiving such a thorough introduction to Chen Tai Chi. She moved on to forward and backward walks and then cloud hands and then started to learn Lao Jia. Her progress in this environment was fantastic. It will still take a long time for her to develop 'fang sung' and movement with Qi but this was a great introduction. From watching her journey, I am sure that other beginners can follow this path as well, if they want. In reality, most people who come here are beginners, even if they've done Tai Chi for a few years, because the level is so high and you rarely find this elsewhere. One thing I would say though is that it helps to have a basically strong healthy body before approaching Chen style Da Jia like this. An ideal background is someone with an existing martial art practice such as Kungfu or at least with an athletic background of some kind. The girl described here had neither, but her posture was okay and Chinese people are surprisingly strong compared to many Western people. If you are a complete beginner, I would personally recommend trying out some Chen Tai Chi first before coming out to the school, and there are opportunites in most Western Countries. Chen Xiao Wang, teaches very widely, but it may be enough to study with a teacher of your own nationality for a weekend or so. There is also an opening here for younger students of Tai Chi and this could be really interesting for some people in the future. I was approached by someone in the UK wanting a GAP year before University, studying Tai Chi in China and now I've asked the school they are quite happy to consider this. I once saw a sixteen year old studying with Chen Si Qiang for a year, although I consider this a little too young. Chen Jia Gou isn't an exciting environment to live in, apart from the Tai Chi that is, so you have to be prepared for this, but internet is available and life can be reasonably comfortable. Bring a laptop. It would probably best suit someone quite mature, with an interest in studying Chinese at University and it should be possible to arrange Chinese lessons while your at the school, probably with a Chinese teacher from the local normal school with decent Putonghua. I'd recommend studying for quite a reasonable period if you do this, perhaps two or three, three months sessions over the year, with a break for the Winter perhaps in Yunnan or Thailand. 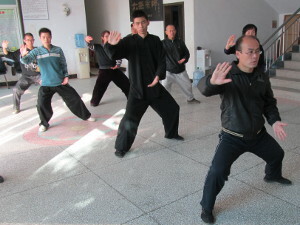 You could then join the long term students, who are of mixed ages, teenage+ with their training in a wide variety of weapon forms, as well as the main Tai Chi hand forms, which they do every day. Really a very interesting GAP year, possibly best done with a friend though unless you are very independent. This experience if it worked well could be totally life changing. My main interest in 2008 was in exploring the health properties of the Chen Family Tai Chi Nei Gong, which Chen Wang Ting learnt from the Taoists. Martial Nei Gong simply builds on this foundation and so it's key to Chen family internal practice, especially in Chen Zhao Sen's line. I spent all the day long, every day, for just over three weeks practising just a few abdominal reverse breathing exercises - very hard work. Most of the time I was alone, except for my companion teacher who practiced it alongside me hour after hour. Chen Zhao Sen would simply check on me every so often, do some kind of energy work for a few minutes and then comment on the quality of my practice. Over the three weeks my body shape changed and muscle started to appear around my abdomen and waist for first time in my life and this continued to develop as I practiced further. My energy levels improved throughout the year afterwards. On my second visit, I mainly did Lao Jia Yi Lu with a small amount of Nei Gong in between. I was really impressed with the quality of detail taught in every single movement and the emphasis placed on the movement of the dantian and the integration of the Nei Gong reverse breathing. Applications were discussed whenever appropriate. Even a brief demonstration of function, would clear up any issues over how to carry out a specific movement. This is a really important part of high level teaching and they do it very well at this school. Sometimes I was taught one to one, sometimes with a partner, other times with a group and then there were also many periods when I was left on my own simply to practice, or do Nei Gong and this is the journey once you are past beginner stage. Again this is simply an example of a student's journey. A fellow Western student at the school already had a good level of Tai Chi and he used his three months at the school to develop higher skills. His Xin Jia form was worked on, both Yi Lu and Er Lu and a lot of his time was spent on Nei Gong at a martial level. He also worked a lot on applications which included pushing hands with Chen Zhi Wei, Chen Zhao Sen's son and the boys in the school. He was a very 'motivated' student and really seemed to make progress with the development of his dantian and the inner control of Qi. Rather impressive to watch. Chen Zhao Sen seems completely happy dealing one moment with people like myself, mainly interested in meditational natural movement and health and the next dealing within someone like my friend, with an ambition to follow Chen Fake and his hyper powered form. So a very interesting school to study at if you really want to develop your Chen Tai Chi to the highest level. 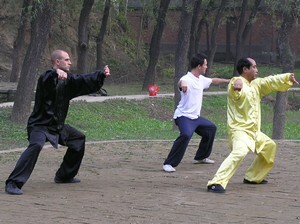 The China Taichi Guide : An Introduction to Chen Zhao Sen's Chen Tai Chi School, Chen Jia Gou. 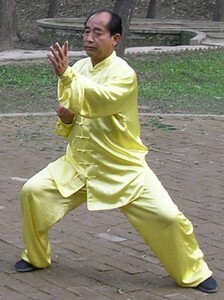 Chen Zhao Sen is a 19th Generation Chen Tai Chi Grand Master and the Head of his Family Lineage of Chen Style Tai Chi.